The object of this game to to make sure you understand the direction of velocity for objects in circular motion. 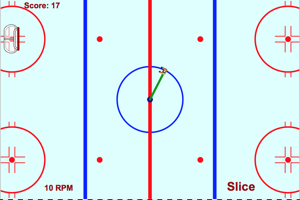 The object is to slice the string at just the right moment so that the hockey player is ejected into the goal. The number of points you earn for each goal is determined by the distance you are from the center of the net and the RPMs. You will be given two minutes to earn as many points as possible. When you are ready to start, hit the begin button. If you are not happy with your score, hit the restart button. Otherwise, hit the end button to generate your certificate of completion. Take a screen shot of this page and share it with your teacher.